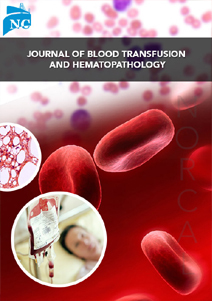 Journal of Blood Transfusion and Hematopathology is an international, peer reviewed, open access, scientific journal that publishes manuscripts like research, review, mini reviews, case reports and studies, short communications, letters, editorials, etc., from all the aspects of blood and blood transfusion, and also pathology dealing with diseases of the blood and the organs which produce blood. We promise researchers, academicians, healthcare professionals to provide a forum to publish their research work online and also they can find current advances in treatment strategies of blood diseases and pathology dealing with diseases of blood and the organs that produce blood in our journal. Journal of Blood Transfusion and Hematopathology’s main aim is to publish manuscripts in all the aspects of blood and blood transfusion, and also pathology dealing with diseases of the blood and the organs which produce blood, and all the manuscripts received under goes attentive peer review process before publication. Our journal strongly supports the developments in the scientific community, and enhances access to high quality research work available online in our journal home page. Our journal mainly aims audience like clinicians, academicians, researchers across the planet to disseminate their high quality research work and perspectives in the fields of blood and blood transfusion, and also pathology dealing with diseases of the blood and the organs which produce blood. It acts as a forum for all the authors to define their attempts in decreasing serious complications after blood transfusion and dealing with patients suffering from lymphomas, leukemias, and other diseases through an open access platform.